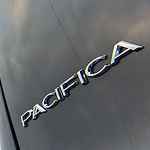 The Chrysler Pacifica is a family-friendly minivan that was designed to keep its passengers safe and comfortable. Whether you need to get your kids to school in Oshawa or get a large load of groceries home, the Chrysler Pacifica makes it easy. Fraser Chrysler Dodge Jeep Ram can show you unique features that could make for an exceptional driving experience. The frame is made of lightweight, high-strength steel that will keep you safe during an accident. It was designed to take impacts from a variety of angles. For convenience when running errands, the Chrysler Pacifica comes with hands-free power sliding side doors. With the simple wave of your foot under a sensor, the doors will open smoothly and let you load your cargo or passengers. You'll also have the option for a hands-free power liftgate to let you load anything in your arms without having to put it down.